Associate Professor Animal Physiology Molecular physiological studies on locomotor/behavioral control in marine zooplankton. Associate Professor Cell Biology, Virology Studies of virus and host cell interactions that regulate viral pathogenesis. Regenerative Biology Organ-level regeneration such as limb regeneration and skin regeneration mainly using an amphibian model system, Xenopus. Associate Professor Biochemistry Structure and mechanism in protein synthesis, Molecular mimicry in translation. Assistant Professor Immunobiology Study on metastasis of cancer, The establishment of murine tumor cell line, Image analysis of the cell movement. Professor Enzymology Structure, function, and application of carbohydrate-degrading enzymes. Professor Food Functional Science Nutrition and biological function of regional food. Pharmacokinetics and analyses of functional ingredients. Associate Professor Food Preservation Phase Transitions in Foods. Food Processing and Storage. Associate Professor Food Science Effects on components and nutritional function of food by processing. Studies on utilization of local food resources. 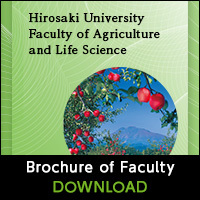 Associate Professor Food Chemistry Nutrition and biological function of food resources. Associate Professor Physiology of Domestic Animals Analysis of taste systems in domestic animals such as chickens, cows, pigs, and sheep. Associate Professor Floriculture ( Ornamental Horticulture ) Hybridization breeding and using tissue culture technique to raise hybrid of ornamental plant. Studying on plant reproduction to utilize and conserve the native wild plant species. 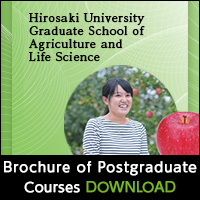 Assistant Professor Pomology We are studying gene function involved in flower bud formation and parthenocarpy in apple. Associate Professor International Agriculture and Rural Development Studies on the relationships between rural livelihoods and dynamics of environment, technologies and institutions. Assistant Professor Agricultural economics/Regional agriculture Research on challenges, opportunities and solutions in rural communities, as well as the utilization of support system in rural areas. Assistant Professor Farm Management Studies on the condition of business analysis of a farmer or the agricultural organization and method of the support of the regional core farmers. Professor Irrigation, Drainage and Hydraulic Engineering Study on Hydraulic design of the water utilization facilities and swimming ability of freshwater fishes necessary for the fishway design. Associate Professor Agricultural Land Physics To develop the soil environment management technique in agricultural land, I’m studying in order to obvious for behavior of the inorganic nitrogen in the agricultural land soil that can be recommended from both the environmental aspects of soil and groundwater and the growth of the crop. Assistant Professor Environment Planning on Mountainous Area Studying earth surface processes and geological phenomena for sediment-related hazard reduction and environment conservation. Professor Dendroecology/Plant Ecology Studies on the forest dynamics under changing environments. Associate Professor Living organisms diversity/classification Form/structure Taxonomy of Mecoptera and Diptera with special interests in insects living in cool / frigid zones. Assistant Professor Ecology/environment Plant Ecology, Plant taxonomy. Studies on the ecology and evolution of wild plants.